Do you have any discounts for retailers and group orders? Retailers will have higher discounts than group orders, but proof of retail store will be required. 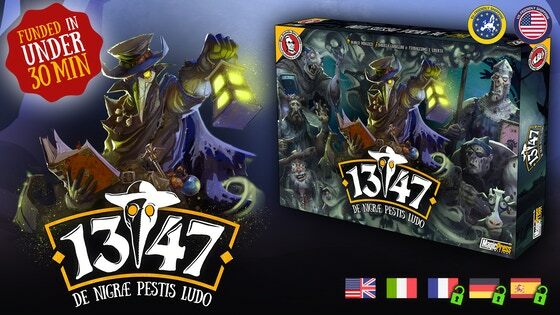 How can I do if I want to pick up the game at Lucca Comics or Essen Spiel? Just change the country of shipment from yours to Antarctica, shich have free shipment. Will I have to pay additional custom fees? We ship from Italy, so the shipment is custom friendly in the EU and USA. Please note that we are not responsible for additional fees or any problem regarding the customs in your country. Almost, unfortunately we cannot deliver 1347 to the following countries, due to problematic delivery conditions: Afghanistan, DRC, Iraq, Kazakhstan, Myanmar, North Korea, Pakistan, Russia, South Sudan, Sudan, Syria, Ukraine, Venezuela, Yemen. When will the game be shipped? In which languages will the game be available? The game is ready in english and italian. It will be translated in german, french and spanish after getting 50 backers from Germany, 50 from France or 50 from Spain. Do you have any discounts for retailers and group orders? How can I do if I want to pick up the game at Lucca Comics or Essen Spiel? Will I have to pay additional custom fees? Do you ship to every country? When will the game be shipped? In which languages will the game be available? I want to know when my reward is shipping. I am having trouble filling out my survey. I would like to make a change to my pledge. I would like help with preorders. I have a issue with my pledge finances. I have a question for the project creator. I have a question not listed here. I want a refund for my initial campaign pledge. I have a question about BackerKit.